The risky and covetous behavior of Wall Street helped trigger the global financial crisis in 2008. While company executives continued to pull down big salaries and bonuses, the government had to spend billions to prop up mortgage outfits, banks, insurance firms and other companies. As part of the rescue program, the U.S. taxpayers invested $182 billion to save AIG, the big insurance company. 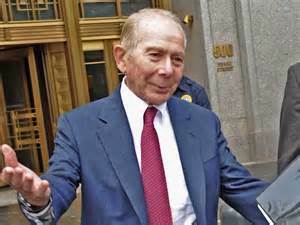 Maurice Greenberg, the former chief executive of AIG, and other shareholders have sued in the U.S. Court of Claims. They say their property was seized by the government without compensation, a violation of the Constitution. In actuality, they have gone to court arguing that they didn’t benefit enough from the federal bailout. Saving the company was not enough, they want the taxpayers to give them billions more. Greenberg and his pals are asking the court to award them at least $23 billion in payment for the 80 percent of AIG stock that the Federal Reserve demanded and got as condition of the bailout. Maurice (Hank) Greenberg has an interesting history. He was forced out in 2005 after regulators found that AIG had engaged in sham transactions that allowed the company and its corporate customers to fudge earning reports, dodge taxes, evade regulatory requirements and hide risks and liabilities from shareholders. Even out of power Greenberg remains important, he controls 20 percent of AIG’s stock. 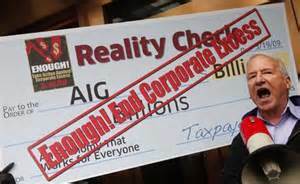 After he was shoved out the door, AIG duly paid $1.6 billion to settle the accounting fraud charges brought by the SEC. During his 37 years at the helm, Greenberg started the lines of business that were the source of most of AIG’s problems during the financial crisis. He is said to have fostered a corporate spirit that encouraged bending the rules and using risky business practices. The parent company and its subsidiaries were found to have been organized in ways to avoid regulatory oversight. The company Greenberg created and ruled ran into trouble as the financial crisis ate away AIG’s solvency. After being turned down by private banks, AIG’s angst-ridden executives contacted the Treasury and Federal Reserve in a desperate search for a loan. During those chaotic times, federal officials concluded that AIG was on the verge of bankruptcy. 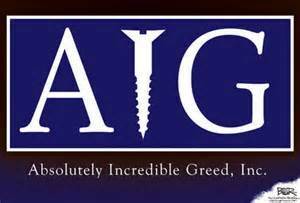 If AIG went bankrupt, it would bring down a number of large banks in in Europe and the U.S. If it were to survive, AIG needed a large cash infusion. To keep AIG afloat, the Federal Reserve, acting as a lender of last resort, pumped an initial $85 billion into the floundering company. 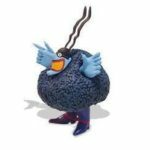 The terms included a 14% interest rate and the transfer of ownership of 80 percent of the company’s stock. With bankruptcy the only alternative, AIG’s beleaguered leaders accepted the deal. According to Greenberg’s attorneys, the government deliberately punished the giant insurance company while it offered better bailout deals to big banks. Given its dire circumstances, AIG’s treatment appears to have been rather mild. When the interest rate was reduced and the terms renegotiated three years later, the government ended up earning around 4 percent on an AIG bailout loan that totaled $182 billion. Greenberg’s legal team is arguing that the law authorizing the government to make emergency loans to private companies includes collecting interest but does not grant the authority to take company stock. The claim appears to be based on greedy speculation because AIG directors voluntarily handed over the stock in order to obtain the bailout funds. 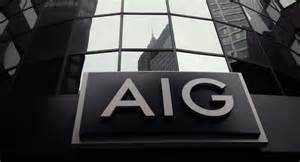 The shareholders retained 20 percent of the stock which could increase in value if AIG survived. If AIG had gone under, the shareholders would have had 100 percent of zero value. This is an astounding example of Wall Street arrogance, begging the government for a company saving bailout, then suing for more. As the company collapsed during the crisis, AIG’s stock price plunged from over $1,000 a share. Since the stock was trading at around $1.25 per share before the bailout and increased to $3.75 after the bailout deal, many irate observers think Greenberg and his cronies should be thanking the government for saving the company, not suing it. The judgements rendered in the case will influence how taxpayers and shareholders share the benefits from future bailouts. So far in the process, the judge has acknowledged the stock takeover point, but did not award any money. This convoluted case of greed will probably be appealed all the way to the Supreme Court. In early June 2015, AIG stock was selling for $60.61 a share. The price was confirmation that being too big to fail does have its advantages.